Pregnancy can cause a lot of pain in the sciatic nerve, which is the largest nerve in the body and runs from the lower back all the way down to the feet. Sciatica is a condition in which the sciatic nerve becomes compressed or agitated, causing shooting pain, tingling, and numbness throughout the sciatic nerve. Some women experience this pain during pregnancy, commonly during the second and third trimesters. Depending on how much pressure is placed on the nerve, pain caused by sciatica can be constant or sporadic. While sciatica can be a side effect of pregnancy, it is not directly caused by pregnancy. Child pose. When practiced for just a few minutes several times a day, this stretch can relieve the back from its over-arched posture caused by the baby. Knees rocking. This gentle rocking stretch helps get rid of inflammation caused by bone-to-bone contact and pushes out fluid that builds up around the joints and causes leg pain. Table stretch. The table stretch is typically best when sciatic pain has started to ease up a little. It also helps to relieve pain in the lumbar spinal segments. The BackBlock routine. The BackBlock is a stretching tool that aids in spinal decompression exercises. Refer to the link above to ensure proper form when working with the block. Use a warm compress on the area where you are experiencing pain. Stay off your feet and rest in comfortable positions as much as possible. Place a pillow between your legs to better align the pelvis and take some pressure off of the sciatic nerve. Strengthen your core and reduce inflammation with pelvic tilts and kegel exercises. Start swimming, an exercise that can relieve pressure on the spine. If your sciatic nerve pain takes a turn for the worst (i.e. increasing frequency and/or severity), contact a healthcare provider immediately. FastMed Urgent Care is open seven days a week and committed to offering safe, reliable, affordable, and compassionate care. We’re here to offer you treatment and guidance during your pregnancy and can help you manage your sciatic nerve pain. 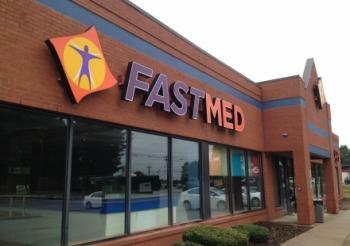 Contact us today to find your local FastMed Urgent Care location. We accept all major insurance plans,including Medicare and Medicaid so check out our Insurance page to confirm that your plan is accepted.